Pasta, pasta, pasta! I love pasta! Actually, I just love anything and everything in the Italian cuisine. Pasta, bread, and carbs in general tend to get such a bad rap in the health and nutrition world. The first thing most "diet" gurus will tell you is that if you want to lose weight, cut out carbs. Well my friends, I'm here to assure you that you do not need to cut out carbs, nor should you skip out on a pasta night every now and again! Carbohydrates are crucial for the body and extremely beneficial. However, carbs come in many different shapes and sizes and unfortunately, they're not all beneficial. A few rules that I like to stick to when weighing out my options include a nice fiber check, whether or not it is actually "whole grain" (enriched whole wheat doesn't count), and the sugar content. If a product is filled with high fructose corn syrup, table sugar, or imitation-wheat ingredients, it's not going to be beneficial for the body. With the weather getting warmer, we haven't had a pasta night in quite some time. But after realizing we didn't have dinner planned for tonight and Target was my only option, pasta night it was! I figured why not share with you guys how to do a "healthy" pasta night and even some tips on how you can simply improve your own! Picking the right pasta is going to be huge for achieving a "healthier" pasta night. As I said above, there are plenty of carbohydrates that have little to no benefit in the body besides giving you energy. However, there are a ton of options on the shelf that can do just that, plus supply nutrients, vitamins and minerals at the same time! Whole Grain/Whole Wheat - opting for a whole wheat or whole grain option rather than regular pasta is the best and easiest way to "healthify" your pasta night. Whole grain carbohydrates supply you with fiber, protein, and even vitamins that most processed flours lack. Bean/Chickpea Pasta - New to the shelves but we're welcoming it with open arms! I was definitely skeptical of this at first but I have fallen in love with bean pasta! Much like whole wheat, it gives you a great amount of fiber and protein. This is the pasta we made tonight and it was delicious! You couldn't even tell it was anything other than whole wheat. Looking at your ingredients should go beyond your box of pasta. Added sugars are hidden in almost everything now a days and you would be surprised to read how many "natural" labels do in fact contain added sugars, preservatives, and chemicals. Carefully check your ingredients label for any hidden sugars. Obviously your sauce is going to have some natural sugars from the tomatoes, but theres no reason for sugar to be on that list! Tonight I made this sauce with our dinner and it was incredible! It was one of the few sauces that did not have any added sugars. I was also really surprised to read all of the vegetables that were included in this jar of sauce! The taste was very fresh, light, and tomato based. You could definitely tell there wasn't any added sugars in this bad boy! 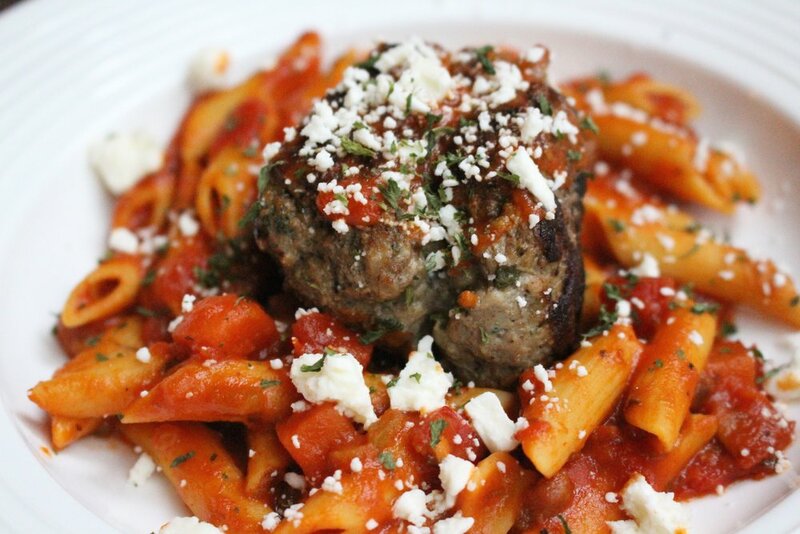 If your thinking, "What's a pasta night without meatballs?!" that yes! I couldn't agree more! One of the biggest mistakes I see is deserting protein during any meal. Protein is the building blocks of muscles and hormones, plus helps with function and regulation of organs and tissues. If I had to play favorites, protein would definitely be my favorite macronutrients. But luckily we get to enjoy them all so I don't have to! Whether you want to go all out and enjoy some classic beef style meatballs or opt for a lighter option with turkey - it's completely up to you! Choose whatever protein source you will enjoy and go with it. It's really important to pair a pasta dish with protein to keep you feeling more satisfied so you don't over eat your pasta. I hope you all give pasta night another chance! Believe me, it's so worth it! Be sure to stay up to date on the latest and greatest by following us on Instagram!